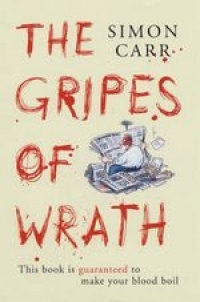 The Gripes of Wrath is the perfect gift book for the ‘grumpy’ generation. It is guaranteed to make you laugh – and also make your blood boil! This mind-blowing collection of absurd and yet completely true stories, rules, claims, and crazy legislation portrays the Britain that we have become, almost without realizing it. Political columnist Simon Carr has scoured national and local newspapers, Hansard parliamentary reports, the minutes of parliamentary committee meetings, statements from quangos and local councils to compile hundreds of true stories, anecdotes and events that will prompt the scandalized response of: “I don’t believe it!”. From political sleaze to massaged waiting lists, from barmy health and safety concerns to bizarre compensation claims, everyone who believes in justice, decency, fair play and common sense will find something in this attractively produced book to infuriate them.